Britain's Prime Minister Theresa May ruled out the prospect of Northern Ireland remaining in the EU's shared "customs union" and "single market" during a speech in Belfast on Friday, reports BBC News. Why it matters: The "backstop" arrangement to avoid a hard border between Northern Ireland and the Republic of Ireland is a key part of Brexit negotiations proposed by the EU. On an island where peace and borders are inextricably linked, the vulnerable prime minister is staring down some high-stakes Brexit complications. The backdrop: The EU's status as a customs union with a single market defines all qualifying countries as one territory without internal borders, allowing for the free flow of people, goods and services without regulatory obstacles. This special status played an important role during the Northern Ireland peace process of the 1990s, WashPost's Henry Farrell writes, as it eliminated the need for border controls and promoted integration between Northern Ireland and the Republic without the delicate implication of political unity. Before Brexit negotiations began, the EU and the Republic of Ireland agreed to a "backstop" compromise under which Northern Ireland would remain in the single market and customs union in the event that a better arrangement could not be reached. Facing pressure from pro-Brexit hardliners, May has now ruled that option out. "The economic and constitutional dislocation of a formal 'third country' customs border within our own country is something I will never accept and believe no British prime minister could ever accept". The big picture: The hardliners are forcing May's hand and pressuring her to adopt a tougher stance on the Irish border, against the wishes of the EU and republicans in Northern Ireland. 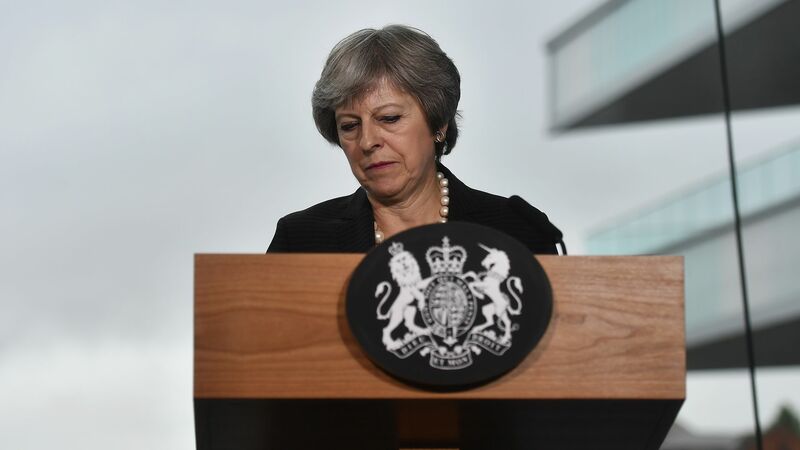 In her speech on Friday, May called on the EU to "evolve their position" as negotiations continue, with the growing threat of a "no deal" Brexit looming overhead. What to watch: As Brexit talks whip up a storm at the highest levels of government, the emergence of new dissident groups in Northern Ireland, including one that calls itself the "New IRA," is causing some of the country's worst outbreaks of violence in years, reports The Economist. Go deeper: Theresa May will need a break from Brussels on Brexit.